“The more things change, the more they stay the same”, I do not know who said that, but the more I delve into the past, the more I realize the truthfulness in those words. 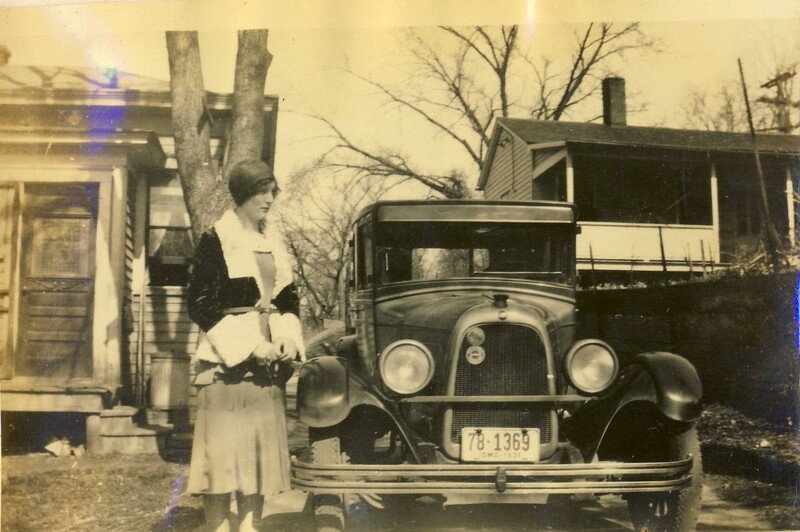 Eighty-two years ago this year, my grandmother graduated from high school. The year was 1931 and the United States was in a depression. Thomas Edison died, and Pearl Buck‘s “The Good Earth” was the best-seller of the year. While times were not easy, I often think that things were much simpler and the world didn’t have near the problems of today. Maybe I should say that I thought things were much easier until I started going through my grandmother’s things. When she died twenty years ago, I was the recipient of all of her cookbooks (probably 500) and when my grandfather died seven years ago, I received all of the photographs to archive and any other papers, books, and magazines of interest. 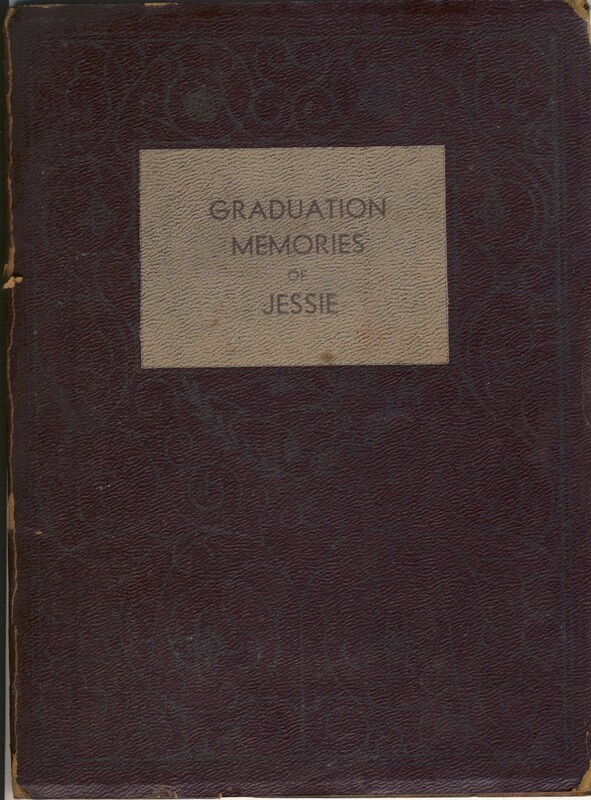 One of the things that I just recently reviewed was my grandmother’s graduation journal. There wasn’t much in it, a few names, a couple of photos and a couple of newspaper articles. I found out that her class colors were red and gold. The class flower was the American Beauty Rose and the class motto was: “They conquer who believe they can.” There was nothing on the pages for ‘dances and parties’ or ‘clubs and societies’. So that will remain a mystery to me. One of the articles was about the Baccalaureate ceremony that was held in her town of Council Bluffs, Iowa, on Sunday, May 31. Grandma wrote that Martha Klotz was her partner for walking down the aisle to be seated for the address. The headline of the newspaper article was “COOPER PREACHES TO A.L. SENIORS” Under the headline, the drop-headline read, “DECLARES WORLD IS CALLING FOR PURITY, CONSECRATION, SACRIFICE.” Below that headline there was a third headline “CITES BIBLE EXAMPLES”. “The world is calling for separation, purity, consecration and sacrifice as portrayed by Abraham, Joseph, Saul of Tarsus and Jesus, more loudly than it did in biblical times, Rev. Francis E Cooper, pastor of the First Baptist church told members of the Abraham Lincoln high school graduating class at the baccalaureate services held at the Broadway theater Sunday morning. Rev. Cooper went on to compare the above mentioned men of the Bible to the character traits also mentioned above: Abraham with separation, Joseph with purity, Saul (Apostle Paul) consecrated to service and Jesus to sacrifice. While I understand that we are not a world of Christians, I think we can all agree that there are lessons that come from a faith/religion that apply to all people’s no matter what their faith. Can we all agree that the premise of the Ten Commandments is good? Do we not want to teach our children not to lie, not to steal, not to kill, etc…? I think if we look passed the fact that the laws came from Moses, who received them from God, we should be able to agree that they are good rules in which to live. Reverend Cooper did not go into details as to why he felt he needed to deliver the words that he did. I can only imagine that he felt that there was too much promiscuity and too many other things happening that broke the Laws of Moses. I have to think that he felt our world was “going to hell in a hand basket”. I wish I would have seen this book when my grandmother was alive so I would have had the chance to ask her about it. I wish I would have taken the time to get to know more about her when she was in high school; what was her life like? What challenges did her generation face? Sadly, all of the members of my family from that generation are dead. There is so much that I will never know. While I still wonder what life is going to be like in the future. While I still worry that we have taken so many steps towards a life without following the Ten Commandments. I can rest assured that Rev. Cooper probably felt the same way that I felt. Because of this, I have hope. I know that my husband and I are raising our children to follow the Ten Commandments and grow to be great adults, just like my grandparents raised my parents and the way my parents raised me. I pray that my children do the same, so that there is hope in this world, that in the end, goodness wins out. “The more things change, the more they stay the same.” There are challenges in every generation to test the character of individuals. And while there are some that fail, it is obvious that over three generations of my family history, goodness has won and we walk in the confidence that we are living our lives with personal service in mind, which gives us great happiness. While she was not Baptist, I think Rev. Cooper would have been pleased with how Jessie Fogle (maiden name) lived her life and taught service to the future generations of her family. I know that there are many of you out there that stop off at your favorite coffee shoppe, either chain or locally owned, and pick up your favorite latte as you head off to work. I have been a stay-at-home mom for years but love a good latte in the morning. Add to that I live in a housing development out-of-town, so it takes quite the effort to drive to town to get the venti, caramel macchiato, or almond joy latte to start my morning. Through trial and error, I believe that I can make a comparable latte at home. It takes just a couple of things that you may or may not have around the house. If you want to have that coffee-house taste at home, continue reading. You do not need an expensive espresso maker that has the steamer attached. My coffee is made with a $25.00 stove top espresso maker. I tend to like my coffee so I use a 16 oz. maker and make one BIG latte. The other thing you need is a milk frother. I have a Bodum Brand which costs $20.00. Those are you two major expenses – $45.00 – the cost of 6-8 venti lattes at your chain coffee shop. With those two items, and flavoring extract from your spice cabinet, the skies the limit. I choose a nice, dark, coffee to brew. I do not purchase espresso. Most of my coffee is purchased through Gevalia so I use both beans and already ground, depending if I want a flavored coffee or a not. For a nice strong coffee use 3 Tbls. for 16 oz. of water. Put the maker on your burner, turn on the flame and wait for it to perk up. Now take you frother and add 8 oz. of skim milk (skim milk froths best). Put it in your microwave and heat it for approximately 2 minutes (you will get a feel for your own likes) I like my milk to have that almost scalded flavor. 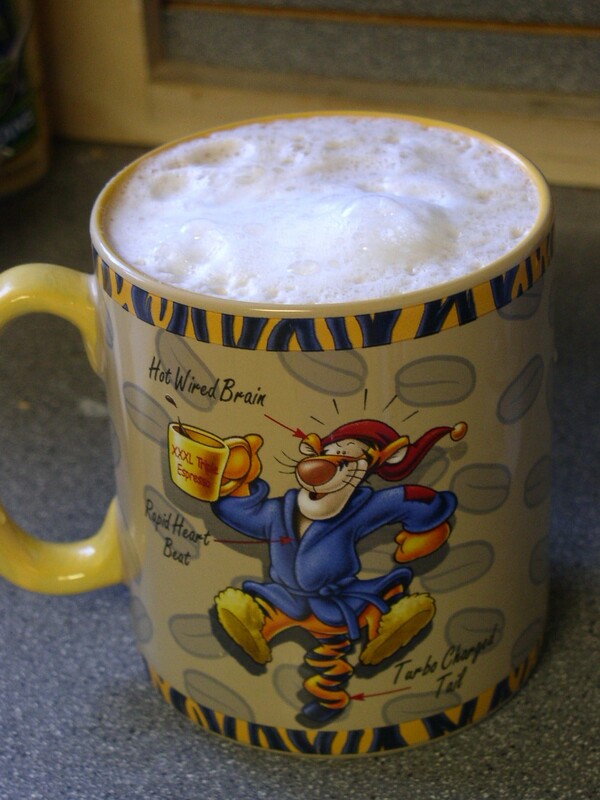 After it comes out of the microwave, put the lid (frother) on the container and froth away. I like my lattes skinny so I use two packets of sweet n low to my drink which is the 16 oz. of coffee and the 8 oz. of milk. (See photo of my cup) I like flavors so I get into my spice cabinet and choose from the numerous flavor extracts I have. My favorite is an Almond Joy. While you can use chocolate syrup, it will leave syrup on the bottom of the cup no matter how well you mix it. I prefer Watkins Chocolate Extract. (Watkins is the only company I can find that makes chocolate extract.) So, chocolate extract, almond extract and coconut extract. I put in the sweetener, the extract, the coffee and then the milk and froth. You can use any flavorings you want and if you want a nice summer drink, add ice. One of my venti drinks (24 oz) sets my day off with alittlecaffeine, milk for my bones and a sweet way to start my day. While I don’t always know how many calories I am getting from the coffee shoppe lattes, I know exactly what goes into my coffee. The calorie count for my drink is less than 100 calories. There are basically no calories in the flavoring, sweetener or coffee. The only calories are in the milk and it tastes fabulous. Most kitchen stores will have the stove top espresso maker and frother. And to find Watkins dealers in your area, go to watkinsonline.com. It is such an easy solution to saving money and having a great latte at your convenience.